Weber Claims Services, LLC - Work Product you can count on! While I prefer to be in the field, I have reviewed catastrophe and daily claim files for property, casualty, and liability claims in the past. I am willing to review if I am not deployed to the field. Do you deploy adjusters that have low production? Is it because they are not fast at writing estimates? Is it because they are required to write estimates in a software they are not familiar with? Want to pour on the volume? Why make an adjuster waste their time fighting a program they are not fast with? Why not speed up and increase your production making your firm and the adjuster more valuable to your carriers? If your an adjuster and you can increase the volume (maybe double or more)... what is it worth? What is it worth when carriers ask for you specifically? What is it worth to be one the of the highest volume producers at a storm? What if with this service you make more money than you would have on top of all of that? If you are the IA firm and you have an under-performing adjuster deployed at a cat and you don't want to pull that adjuster for a plethora or reasons, why not soup up his or her production? The adjuster will likely make more money, and your firm will likely double it's income for that adjuster. It could save an unwanted encounter with the carrier wanting to discuss low production and net everyone more income and the carrier a quicker end result. Contact me for fee schedule and to discuss this opportunity in greater detail. 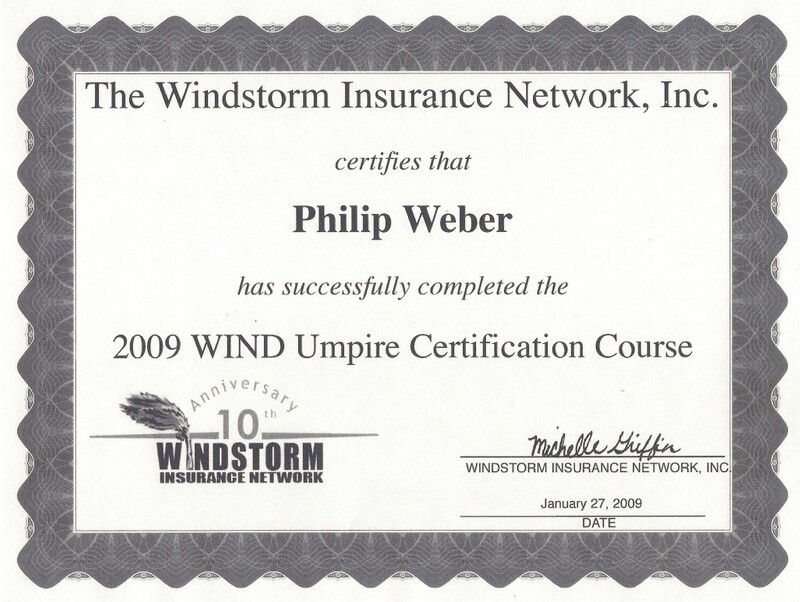 When the carrier and insured do not agree and you are looking for someone that is knowledgeable and fair, then consider Philip Weber as your umpire. Many of the smaller carriers do not have the staff to field review a sample of each of the independent adjusters that represent them. I am kept for cleanup nearly every time I am deployed. Why? because if my files reopen it's usually because a contractor is hoping for more money, not because I didn't check for damaged siding, or because I didn't get on a roof (no matter how steep) or because I rushed and simply wasn't thorough. This same thoroughness results in less reopens, savings for the carrier in many cases, claims that stay closed with happy customers and happy carriers. Why is this important? Every time a claim is reopened money is lost for that carrier. The insured and or insured's contractor will cal meaning the carrier has to filed that call. That claim must now be assigned to an adjuster and if you are not one of the big carriers it is likely it is being assigned to an IA firm for a premium. The new adjuster may call to inquire about the claim, another call potentially fielded by the carrier. Even if the IA calls the IA fir, they may call the carrier to discuss it. The insured is unhappy because now the claim seems to be a very long process and their satisfaction tends to be less with reopened claims. This could result in lost customers. The supplement will now have to be reviewed by the carrier and then potentially more checks sent. What is you had a database tracking adjuster performance? Tracking initial call attempt and contact from time and date of assignment received,number of total claims to number of reopens, insured's satisfaction (with initial inspection, phone etiquette, how many days to close from assignment date, and more). Please contact me to discuss how this service can benefit your bottom line. How, from my reports, the carrier will be able to determining which adjusters are delivering quality work product and it will allow you to rate the adjusters that work on your behalf. Help you to make sure your insureds are getting the service they deserve. In my adjusting carrier I have repeatedly been called on to handle complicated claims and or where the insured is disconcerted. The following letter was sent to me by the Account management Supervisor for the carrier. There had been prior adjuster's that had inspected the loss and there was a miscommunication that had the insured upset and threatening legal action. I was asked to re-inspect and work out and solve any problems if possible and attempt to come to an agreement. The insured was angry and unhappy that I was there and told me upon my arrival that legal action was imminent. I explained to the insured that I understand that there had been prior mis-communications and I was there to re-inspect in an effort by the carrier to resolve any disagreements, if possible. The insured again stated that he did not think anything could be worked out. I asked the insured if he would work with me in the effort to resolve the differences and even if I could not resolve them at least I could understand what he had gone through and what had happened. As we reviewed and re-inspected, the insured shared much of his frustration. As the issues came to light we were able to discuss, defuse and resolve them. By the time I was leaving the insureds were in good spirits and told me repeatedly how happy they were I was sent and how much they appreciated the information I conveyed to them. The letter below was attached to an email as a result of my re-inspection and time spent with the insured. Here's a little attaboy for Phil! This insured was VERY difficult to deal with on my end so I commend him for his efforts here! Great Job! RE: Remittance of the depreciation amount of $854.98 (Eight Hundred and Fifty Four Dollars and ninety-eight cents), held pending the roof replacement completion on the above listed insured property. First of all, Barbara and I would like to thank you for your thoroughness and concern, on our behalf, with regard to the work completed in the replacement of the roof on our home. Mr. Weber was very thorough in his inspection. We also appreciate his taking the time to explain your position, as the insurance company, on what could be equitably claimed. It gave us a better understanding into the possible misunderstanding and resulting difficulties and that have ensued between your office and to us. We also thank you for your timely response in handling the additions to the claim. As you now possess complete affirmation as to the materials used and the work accomplished on the roof we ask that you remit the above stated amount held as depreciation until the work on the roof was completed. Again we thank you for the diligence that you have exercised in handling our claim and for your kind attention and co-operation in this additional matter.